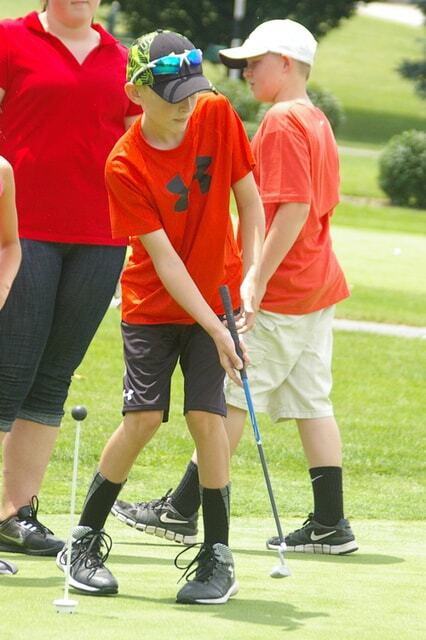 A total of 38 youth attended the Stillwater Valley Golf Club Junior Summer Camp. VERSAILLES – Stillwater Valley Golf Club had a larger attendance than usual for its Stillwater Valley Golf Club Junior Summer Camp. The annual camp, which was open to boys and girls ages 8 to 15, drew 38 youth to the golf course, most of whom were from Versailles. The camp usually draws about 20 to 30 golfers. The camp covered everything from chipping and putting all the way up to full swings. In addition to instruction, there were competitions including a tournament to end the five-day camp. The campers made a lot of progress with their games from the beginning of the camp until the end, Frey said. Frey also was glad to see so many youth getting out and playing golf and also building friendships. For more information on the Stillwater Valley Golf Club, visit its website at www.stillwatervalleygolfclub.com.